The remarkable properties of silk fibres have gained them a prominent place in the field of technical textiles. 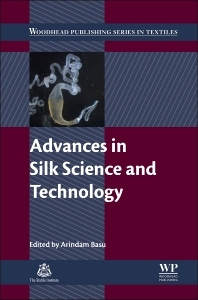 Advances in Silk Science and Technology explores recent developments in silk processing, properties and applications. Techniques for manufacturing spider silk are also discussed and the current and future applications of this fibre are reviewed. Part One focuses on the properties and processing of silk from both silkworms and spiders. It addresses recent advances in our understanding of the properties of silk and offers systematic coverage of the processing of silk from spinning through to finishing, as well as an analysis of quality testing for silk fibres, yarns and fabrics. Part Two then addresses important applications of silk from silkworms and spiders, and includes chapters on the use of silk in polymer matrix composites and in different kinds of biomaterial. The book concludes with a chapter on developments in the use of silk waste. Arindam Basu is Director General at the Northern India Textile Research Association.